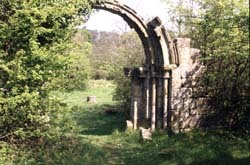 Following the Dissolution the abbey was acquired by the Grey family who later robbed the abbey for its buildings materials, leaving few upstanding remains. The site is now marked by earthworks, slight walling of the church, large quantities of displaced stonework, and the re-erected cloister arcades. (4) The remains are generally accessible to the public.